Sooner or later, Dear Reader, we Private Investigators will be sought out by a particular type of individual. 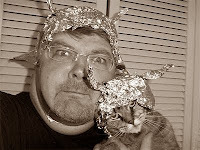 One that wears tin-foil hats or believes they are being followed by black helicopters and the like. Surprisingly, these types of individuals are not all too uncommon. I receive several such enquiries a year from people who believe they are receiving messages directly into their brain or are otherwise harassed by some conspiratorial global organisation. Newsflash, MK-ULTRA has been abandoned people! It must be true, the CIA said so. I guess that life is more interesting if you are being hounded by black helicopters or those pesky Mysterious Strangers that lurk outside your house late at night. Particularly if you are a suburban mother of 3, or used-car salesman, by day. I was surprised several months ago when such an individual emailed me asking for assistance stated that he'd also hired two firms abroad to try to identify which parties were responsible for beaming him these messages. Then I was dismayed to learn that they had taken his money rather than suggest he should first discount medical grounds. Seriously, if this sounds like you, go see a doctor first.